We have rooms with sea views and rooms on ground floor. Relax in the sun while working on that tan. Take a walk on the well known “jetty”, visit the Aquarium, stroll through Central Swakopmund with its beautiful German architecture. Welcome to Swakopmund Accommodation, a true family holiday accommodation establishment located in Vogelstrand, Swakopmund, Namibia. 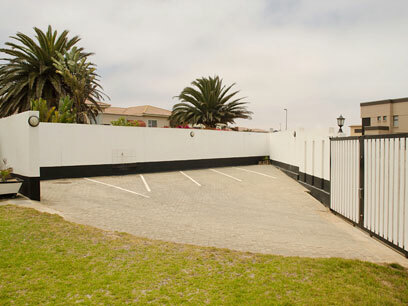 Our accommodation units are self catering apartments. We are only about 200 meters from the beach and within walking distance from the brand new “Platz am Meer” shopping mall, restaurants, coffee shops and more. Swakopmund has a lot to offer the visitor, holiday maker and tourist alike, after all, it is Namibia’s number one holiday destination. Spoil yourself to wide open beaches, or if you are the active type, take a quad bike tour into the Namib Desert Dune belt, or go skydiving. Enquire from our reception for bookings and more information. We hope to see you soon. Near Platz am Meer shopping mall (600m) with a wide variety of restaurants, coffee shops and shops. About 4km from central Swakopmund via scenic coastal road. Our accommodation units are spacious, clean and fitted with comfortable beds and good furniture for your convenience. Safe and secure parking on the premises. Home away from home. Value for money. Effortless check in Clean and spacious. Will return again. Ideal for breakaways. The hosts were very helpful and we enjoyed our stay. The beach is walking distance, but the town is +- 5 minutes drive away. The hosts accommodated us on short notice. We were able to leave the dogs at the B&B while we went out for the day. We had a very good one night stay. The reception was very warm and welcoming and the management went out of their way to help us when we had a problem with our vehicle. Very nice room, clean and comfortable and a great situation by the beach and we felt very good value. We would definitely return.